Grey clouds scudded across a flat, empty sky. Far below, the countryside stretched between deserted cities. Every day brought a further encroachment of wilderness into the urban wasteland. 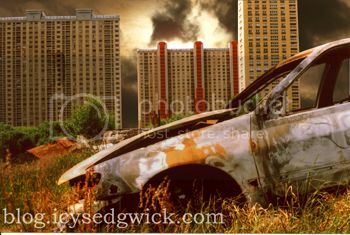 Grass grew tall in the narrow lanes between the abandoned blocks of flats, and weeds pushed up through cracked concrete. Rusting cars stood in the street, smashed into one another where occupants had collisions in their hurry to leave. Moss coated discarded possessions in overgrown gardens, and tree roots erupted through tarmac as the forest retook the roads. No animals moved in, as there were no animals to move, just as there were no longer any people. Crates of goods that would never be bought or sold sat on rotting pallets in forgotten warehouses. Dust lay thick on nylon carpets in vacant flats, and TV screens reflected empty rooms. Belongings with no owners became mere objects, unused and unloved. Houses were no longer homes, instead simply tombs to bygone consumerism. Days passed, seasons turned, and the peace continued. Yet somewhere in the depths of the silence, between the emptiness and the darkness, something moved.